When our neighbor friend Naoko put the cute pink child seat on the front of my bicycle, I didn’t realize the controversy we were inadvertently entering! The front seat is for Annie; the back seat that has been on for several years is for Owen. 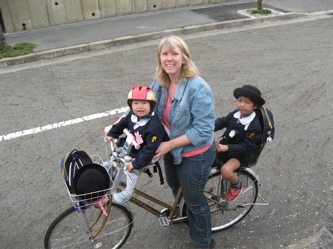 Now, I can ride both of our children on our bike to yochien (preschool/kindergarten). Somehow, I felt quite proud the first time we went for a spin around the block — I really have ARRIVED as a mom in Japan! Although it’s a bit awkward to pedal the bike with a seat right at your knees, I have adjusted my riding posture and enjoy the extra challenge as I join many, many other moms across Japan who are transporting their children in the same fashion. Now- the controversy. There have been a lot of news programs recently on the desire of the Japanese government to outlaw the 3-seated bikes because of safety concerns (it is a lot more challenging to steer with a child on the front). I’ve been told this past week that there is actually a law against this, but that it is not being reinforced because so many moms have thrown a fit. For so many, this is their main — only– method of transporting their children. One woman interviewed on the news said she needs to take her children 5 kilometers on her bike to school, and then go to work. Many who live in the cities in Japan don’t have a car because parking is unfeasible and too expensive. But, on the news, they are saying that Osaka police are going to start cracking down this summer. Women are threatening to stop having children, thus further decreasing the declining birth rate in Japan. Who will win? Meanwhile, bike makers are exploring options for making safer 3-seated bikes. Our solution, for now, is biking defensively, but more importantly using bike helmets, hardly worn here in Japan. We’re hoping to start a trend at yochien. We’ll keep you posted! YOU da mom!! YOU da mom!!!!! Congratulations on your new skill! I am most shocked when I see a mom with a kid in a front seat, one in a back seat, one strapped onto her chest or back, holding an umbrella, biking through traffic.